Ms. Hiwot Teffera was one of the active youth revolutionary members of Ethiopian People Revolutionary Party (EPRP) fought against Ethiopia Military Dictator, known as “Derg”, who Ruled Ethiopia by Terror . Her book entitled “Tower in the Sky” provides many aspects of the clandestine political works in Addis Ababa and surrounding cities that occurred mainly between 1974 and 1978 Ethiopia Revolution. Ms. Hiwot tells concise stories which provoke questions and angers why things went wrong during that revolutionary period. It is sad to read that her and several testimonies of dozens of young men and women who found themselves in the middle of one of the most traumatic period in Ethiopia history. Her commitment to advance EPRP’s mission made her an unwavering revolutionary militant of that period. Her memories of the brutal and terrifying incidences are incredible. She described in detail the chilling, riveting accounts of the red terror era until she released from Kerchele prison in 1986. The book mainly dedicated to her boyfriend and comrade as she put it “To my hero Getacheu Maru”. In past several years many authors have begun to write about EPRP’s struggle against Derg. Ms. Hiwot who spent several years in 1974 movement and speaking out is very essential to understand the failure of Ethiopian revolution. She takes the reader in emotional and very sentimental roller coaster ride behind to the secret movement. This book can be seen as an eye opener to current college young generation dormancy in politics and lack of political ideology. Ms. Hiwot Teferra grew up in Harar and went at Medhane Alem high school. Her political activity started in grade eleven as elected class representative to the Student Council. She was the only female representative in the Council. The author tells us, in those early years, she had access to variety of reading materials outside the school system, and she also often went to movies on weekends. This outside of school exposure might have enlightened her to the segment of progressive group of Ethiopian society. Although her health was in very terrible shape since her childhood, she managed to join Haile Selassie University in 1972 at age eighteen. During her college year, she was recruited to secret political study group formed by former Mechanical Engineering university student and later Shimeles Habte High School teacher Getachew Maru. Getachew was the main organizer of study circles in the cities and provinces. Ultimate this study circle became large network and changed to clandestine political organization called itself Abyot. Finally Abyot merged with other radical organization Democracia group later known as EPRP. The official organ of the EPRP has been “Democracia,” and that of Abyot,” Abyot. The Secretary General of the EPRP was Berhanemeskel Redda. He was a well known and respected leader in Haile Selassie University Student movement since the sixties. The aim both organizations were to establish Socialist System within Ethiopia. As an active participant in Abyot organization study circle, Hiwot developed her revolutionary awareness to Marxism-Leninism, Mao theories as guiding ideology to change the world social order. She was caught between the dream of these theories and reality of the existing Ethiopian political situation. Her romantic encounter with 1974 Ethiopia Revolution and the idealization and love of EPRP bring her story in special way, to say the least; it is a human will and endurance. For several years the EPRP underground movement leader’s names largely hidden from the most of its own members. The method of struggle/tactics of the Party’s became unquestionable. Members had to accept the clandestine Party order without asking critical questions. The reason for this is the rule and the regulation of the party, top—down order, not participatory, etc.. According the her account, the two founders of the party Berhanemeskale Redda and Getachew Maru raised several political issues against the party stands. She stated they were against the main EPRP’s policy of conducting urban guerrilla warfare and not accepting the Derg call for a united front. In addition they did not favor EPRP’s position calling for establishment of a provisional people’s government. This caused them to be expelled from the party. She states that “The “Yebelay Akalat” came to our meeting a few days later…….The talk centered on the Party’s new policy: the need staging urban armed struggle... The justification was that the “objective conditions” of the country had changed and that the party had to defend itself…They said that Ha and Le (i.e. Berhanemeskale and Getacheu) were expelled for disciplinary reasons (p205-206)”. Berhanemeskael left the city to begin rural armed struggle in northern Shoa later captured by Derg and killed. Getachew Maru was detained by EPRP’s defense squad in the city of Addis Ababa. The author also brings out in length why the two expelled comrades choose those stands, and how the Derg subsequently crushed out EPRP's urban structures. During this decisive hour, she said “Thirteen houses were raid last night. One of them was the house comrade (i.e. Getachew) has been detained in. When the comrades heard the soldiers knocking at the gate, Getachew told the squad leader they should escape. The squad leader refused….Getachew hit the comrade’s arm with karate and when the pistol fell on the floor, he jumped out of the window. The squad leader picked up the pistol and followed him shot him dead” (page 268). The book continues on other account on the same subject. It states “Squad member…and his colleagues gave a statement during interrogation saying that Getachew was not shot dead. They beat him to death with club….We beat a comrade like Getachew Maru to death. We didn’t even have respect to a founding member such as him” (Page 275). It was shocking account. Dependent for the most part on secondary sources, I assume her notes add some true story to his unfortunate death by EPRP hand not by Derg, nor is it entirely free of factual errors is remain as question mark. The author wrote in detail particularly on Getachew Maru’s role pre and during 1974 revolution period. She loved him dearly as her boyfriend and comrade. She described him as genuine revolutionary, very serious and disciplined, believe in open free discussion to resolve political issues. He was valedictorian student prior joining the university and he continued to be outstanding student in the University. He was well read on communist and socialist theories. Although through out the book, the author shows extreme caution not to fault EPRP, probably due to her love of the party. Reading this book, tells clearly that the political turmoil that created a faction within the EPRP, the debilitating conflict with Mesion and other radical organizations was tragic for young Ethiopians revolutionaries. The harsh methods used to quash dissent within the party, the party major setbacks, and unsuccessful regrouping efforts in cities are also described in this book. The author attempts to uncover her defiance against the military government, and unimaginable price paid by Ethiopian people, and a commitment to serve her party is clearly stated. The author’s observation to some extent is similar to others. Urban armed struggle was intended to conduct as a limited self-defense in the cities but it spontaneously changed to urban style war to defeat the Derg. Hiwot has made an important contribution to the history of unfinished Ethiopian politics. Enjoy the reading! An eighteen-year old girl sets out to meet a young man whom she had never met before and is swept away by a series of events that transformed her life in a way she could have never imagined. 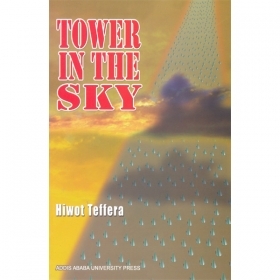 Tower in the sky is the story of love, revolution, hopes, dreams, violence, terror, trust, betrayal, tragedy, disillusionment, self-transformation and the triumphal power of the human spirit. The book vividly depicts a moment in Ethiopia's history when the country convulsed with violence unleashed by a bloodthirsty military government that massacred an untold number of people, especially the young and plunged the country into darkness. It is also the story of thousands of young people who stood up against one of the most brutal dictatorships in history and fought for equality, freedom, social justice and human dignity.